Hello, spring! We’re pulling our grill out of the garage and into the backyard this week, and cooking on it every chance we get until fall. Deciding what’s for dinner couldn’t be easier when I have these simple marinades in my arsenal. Each of these 10 best marinades is totally tasty on chicken, beef, or pork and has five ingredients or less (not counting salt and pepper). 1. Easy 7-Up Marinade from Chef in Training uses 7-Up, garlic, horseradish, soy sauce, and oil. 2. Balsamic Marinade for Steak from Everyday Maven uses olive oil, balsamic vinegar, spicy brown mustard, salt, pepper, and parsley. 3. 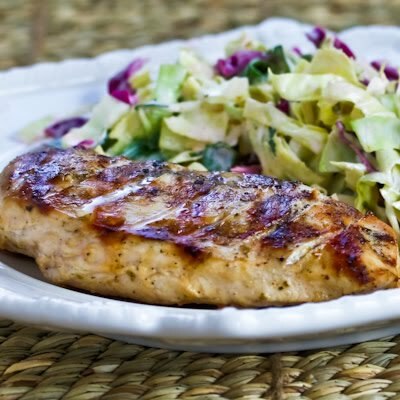 Lime Chicken One-Minute Marinade Hack from Momtastic harnesses the power of the microwave to speed up a four-hour marinade into just a minute. Use this hack for any marinade—it’s a game changer. 4. Greek Chicken Marinade from Kalyn’s Kitchen uses oil, lemon, Greek seasoning, poultry seasoning, oregano, and pepper.